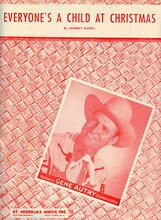 Gene Autry Entertainment would like you to know more about talented songwriter Johnny Marks. His family and publishing company, St. Nicholas Music, shared the following with us. It has been said, Songwriters Hall of Fame member Johnny Marks achieved in his lifetime, "what is probably the most dreamed-of, sought-after and elusive goal of all songwriters: immortality." Others referred to him as "Mr. Christmas of the music world," "the man who owns Christmas" and, to quote the Associated Press, "is as identified with Christmas songs as Stephen Foster is with sentimental ballads of the Old South." 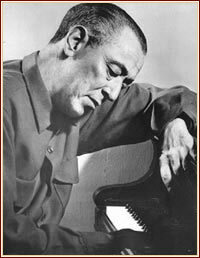 Four of his Yuletide hits became award-winning classics, each having sold countless millions of records. They are Rudolph, the Red-Nosed Reindeer, I Heard the Bells on Christmas Day, Rockin' Around the Christmas Tree and A Holly Jolly Christmas. He is also the outstanding composer of scores for television specials, which together have been viewed by over a billion people. 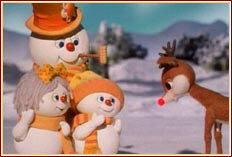 They are Rudolph, the Red-Nosed Reindeer (1964 Rankin/Bass) with Burl Ives and the longest-running special in TV history, Rudolph's Shiny New Year (1976 Rankin/Bass) with Red Skelton, and Rudolph and Frosty's Christmas In July (1979 Rankin/Bass) with Ethel Merman, Shelly Winters, Mickey Rooney and Red Buttons. All three have scored Top-10 Nielsen ratings. Other TV specials for which Marks composed the scores were The Ballad of Smokey the Bear (1966 Rankin/Bass) with James Cagney and The Tiny Tree (1975 DePatie-Freleng Entertainment) with Robert Flack and Buddy Ebsen. Marks also established himself as a successful composer for TV commercials, which he wrote for General Electric over a three-year period. In 1967, one of these commercials won the Gold Medal Award for the International Film and TV Festival. Rudolph, the Red-Nosed Reindeer started Johnny Marks' phenomenal success with Christmas songs in 1949, although he had already established himself as a successful composer prior to this. It is probably the biggest, worldwide hit of all time, and in 1972 the song was voted into the Songwriters Hall of Fame. 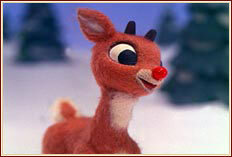 This Week Magazine called Rudolph one of the two most valuable songs in the world. It has sold more than 150,000,000 records. In excess of 8,000,000 copies of sheet music and 25,000,000 copies of 140 different arrangements for orchestra, band, choral, instrumental, etc. have been sold to date. The lyrics are translated into numerous languages. 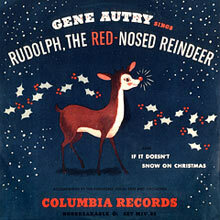 Rudolph, the Red-Nosed Reindeer was first recorded by Singing Cowboy Gene Autry for Columbia records on June 27, 1949 in Hollywood and introduced by Gene in Madison Square Garden. It immediately swept the country. The following year, it could be heard blaring from radios from Piccadilly to Tokyo. 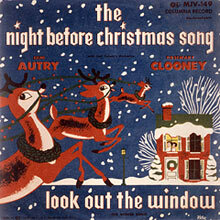 The original Autry record has gone over the 12,000,000 mark, the all-time best-seller of Columbia Records and the second biggest Christmas record of all time. 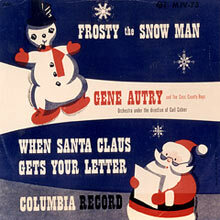 Gene Autry's Columbia Records recording of Rudolph, the Red-Nosed Reindeer was inducted into the Grammy Hall of Fame in 1985. There have been more than 500 recordings of the song. In 1973 the International Society of Santa Claus presented their first award honoring those for their contribution to the spirit of Christmas to Johnny Marks for Rudolph, the Red-Nosed Reindeer and Irving Berlin for White Christmas. The runners-up were Charles Dickens' "A Christmas Carol" and Clement Moore's "'Twas the Night Before Christmas." Run, Rudolph, Run (also known as Run, Run Rudolph) was recorded by Chuck Berry in 1958 and released on Chess Records and made it to #69 on the Billboard Hot 100 in the US and in 1963 Berry's version made the UK list, peaking at #36. The song has since been recorded by a variety of artists including Cheryl Crow, Jimmy Buffett, the Brian Setzer Orchestra, and the Grateful Dead. I Heard the Bells on Christmas Day was first recorded in 1956 by Bing Crosby. In 1981, Metropolitan Opera star Placido Domingo joined a list of some 70 other artists who have recorded it, including Frank Sinatra, Harry Belafonte, Sarah McLachlan, Eddy Arnold and Johnny Cash. More than 4,500,000 records have been sold to date. The lyrics were adapted from a poem by Henry Wadsworth Longfellow. Rockin' Around the Christmas Tree became an international hit in 1960, as recorded by Brenda Lee. While the song has been recorded by many other stars, Brenda Lee's version enjoys the most popularity due to her crossover appeal in the radio genres of Top 40, Adult Contemporary, Country Music, Oldies, and Adult Standards. With additional artists like Amy Grant, Cyndi Lauper and Miley Cyrus (as Hanna Montana) Rockin' Around the Christmas Tree has sold more than 4,000,000 records. 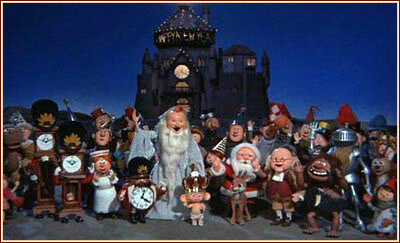 A Holly Jolly Christmas was a hit for Burl Ives in 1963 when he introduced it in the Rudolph TV special. Some 3,500,000 records have been sold. Other successful Christmas songs written by Johnny Marks include Silver and Gold, The Night Before Christmas Song, When Santa Claus Gets Your Letter, A Caroling We Go, and Joyous Christmas. In 1956, Marks compiled and edited the Christmas Community Lyric Book, which sold over 4,000,000 copies. John D. Marks was born in Mount Vernon, New York on November 10, 1909. He obtained his B.A. Degree from Colgate University in 1931, later taking music courses at Columbia University, as well as studying in Paris. He was a member of Phi Beta Kappa, Mu Pi Delta, and Kappa Phi Kappa. During World War II, Marks served four years in the Army. He enlisted as a Private and rose to the rank of Captain. He commanded a separate company, having received the appointment from General Eisenhower in France. He was awarded the Bronze Star Medal and four Battle Stars. His company received the Meritorious Service Plaque and served with General Patton's Third Army from Normandy to Salzburg. Johnny was an active songwriter beginning in 1935. He wrote over 150 published songs and some 750 still unpublished songs. Among his hits, other than Christmas songs are Everything I've Always Wanted, an ASCAP Award winner with Porter Wagoner and from the TV special Rudolph and Frosty (Marks' four Christmas hits also received ASCAP Awards); Anyone Can Move a Mountain, recorded by Kate Smith and Harry Simione and from the TV special The Ballad of Smokey the Bear; Address Unknown, with the Ink Spots; Who Calls, with Bing Crosby; She'll Always Remember, with Glenn Miller; and Don't Cross Your Fingers, Cross Your Heart, with Sammy Kaye. In 1949, Song Hits Magazine selected him as the "Songwriter of the Year." 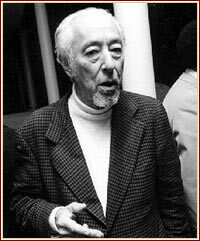 Johnny Marks was an active member of the American Society of Composers, Authors and Publishers (ASCAP) and was on the Board of Directors, the Board of Review and the Advisory Committee and from 1957 through 1961 was the Director of ASCAP. Marks became a music publisher in 1949 when he organized St. Nicholas Music, the foremost publisher of Christmas songs. ASCAP selected him, in 1963, to join a USO Songwriters unit to entertain American servicemen in the Far East. The following year, he served as a judge at the Stephen Foster Memorial Singing Contest. In 1981, Johnny Marks was inducted into the Songwriters Hall of Fame. Johnny Marks died September 3, 1985. His songwriting legacy lives on through his publishing company St. Nicholas Music which is run by his son, Michael Marks. For a more detailed list of Johnny Marks' songs, visit the Songwriters Hall of Fame website here.